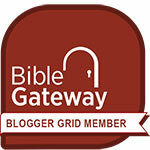 Thanks for your patience and understanding as I deviated from the regular devotional blogs for the past couple of weeks. Leading short term teams to two countries left me with precious little time to do anything else, writing included. I had an interesting experience on my flight from Budapest to Berlin. The 25-year-old Hungarian man sitting beside me was reading a book with Arabic writing—like a language learning book. So I asked him if he was studying Arabic. He said yes. He told me that he has lived in Jordan, Yemen, and Egypt. Now he’s planning to move to Pakistan for two years to study I***m.
Could this young man be being radicalized? I wondered. I asked him a few questions about his faith, and then I asked if I could tell him about mine. He said yes. So I told him about two trains of thought: one says we must earn God’s favor through good works. The other says God wants relationship with us and has made it possible through Jesus Christ. Salvation is a gift. So is the peace that Jesus gives anyone who places their trust in Him for salvation. “Do you have peace?” I asked. He shrugged. “Maybe.” Sadly, he told me that he’d attended a Christian school for six years but saw a lot of hypocrisy in the teachers’ lives. He’s turned off Christianity for that reason, but he’s obviously seeking something – anything – to fill his spiritual void. I offered him a Bible but he refused it. I told him that our sitting side-by-side for this flight was not a coincidence, but that God arranges every detail of our lives for a purpose. “Perhaps His purpose for you today is to know that He loves you and wants relationship with you,” I said. “Will you consider the things you’ve heard in our conversation?” He agreed. Minutes later, the flight ended and we went our separate ways. I don’t know what this young man’s intentions are, but I suspect they’re questionable. One thing I do know, however, is that God is drawing him to Himself. Why else would He seat the two of us together for that flight and then give such a clear and easy opening for a significant conversation? God is at work at all times and in all places. 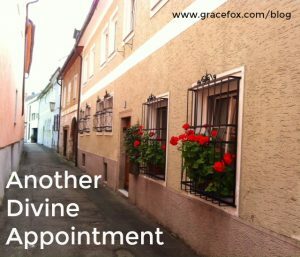 Divine appointments are His specialty. Please, for the sake of men and women who don’t yet know Jesus, let’s make ourselves available to Him so He can involve us in His eternal purposes as He draws them to Himself. Let’s ask Him to put people whose hearts are prepared for the Good News in our path. They’re at our city parks, grocery stores, doctor’s waiting rooms, on buses, planes, and trains. They live next door. Some attend our churches. They’re everywhere, and they need Jesus. I’ll fly home on Monday. Perhaps you could pray for another divine appointment for me as we travel? That is really something Grace! Who knows if what you said and the Holy Spirit’s prompting didn’t turn him away from something deadly! I hope so! I was able to share why I went to Slovakia with two guys visiting the Island wanting fishing’directions’ here on Vancouver Is. I was gushing about the countryside and Spisky Castle, etc. When I told them about the English classes I also told them we wanted everyone to know God loves them and wants to have a relationship with them. They got quiet and changed the subject. But they asked, & I told them! I think that was a Divine appt. too. You are right. We need to be willing and led by the Holy Spirit I hope you and the teams are kept safe and energized for His work. Praise God! The Angels in Heaven rejoice when one more person comes to Christ! and we do too!!!!! Be brave, be strong, for the Lord Thy God is with Thee!!!!!!!!!! Hi Marge. I’m trusting the Lord to continue to bring believers into that young man’s life, and to put a desire for the Word and for Truth in his heart and mind. He draws people to Himself, but He gives us the privilege of having a part of the action! Thanks for sharing your story, Mari-Ellen. It does sound like a divine appointment. I find that when they happen, I don’t have to force anything. Conversation just flows naturally to spiritual things. It does help to ask relevant questions that can turn the conversation, though.